When your computer is acting up or driving you crazy, the absolute last thing you want to do is lug it down to the local repair shop. So many cables. So many connections. And why is it suddenly so heavy? It’s stressful just thinking about it! Fortunately, tech support has come a long way in recent years and you now have another option: remote access support. Just like it sounds, one of our experts will connect to your computer through the Internet and fix the problem. You can even watch the entire process on the screen or step away and we’ll call you when the problem is fixed. As long as the computer starts and has a working Internet connection, you can simply put your feet up and watch the show! Remote support isn’t just a new technology that lets you stay in your PJs for longer, it’s a better way to approach a huge range of issues, with some pretty great benefits. High fix rate: While it does sound impossibly futuristic, around 90% of problems can be solved this way, quickly and efficiently. We’re sure you’ve been on the frustrating end of a call-center style support session at least once and can guarantee – remote support is nothing like that. Our technicians don’t ask you to click a hundred buttons and read the screen back, they simply identify the issue and fix it for you then and there. Location independent: For some people, the best part of remote support is that it doesn’t matter where YOU are either. You could be away on vacation with your laptop, at home with the kids, or under 6 feet of snow in a record-breaking blizzard, and our remote techs can still fix your computer. Fortunately, your computer loves staying where it is. They’re actually more likely to have issues when they’re moved around a lot, so this is the perfect solution. There’s no need to pack anything up, drive across town to drop off and then back again for pickup a week later. Our technicians know you have better things to do, and will remote support you in any way they can. Complete privacy: Remember how you can watch the technicians move things around the screen? There’s no better way to know your privacy is protected than to see exactly what’s happening. Unless they’ve identified them as the issue, our experts won’t go anywhere near your private files and photos. You don’t even need to move them to a folder marked ‘private’, our technicians are laser-focused on getting you going again and that’s all. You’re in control: Our technicians can’t access your system unless you allow us to. In fact, we need you to download a special piece of software before our technicians can do anything. Then we call via phone to arrange a time for us to access the computer. If you don’t want to watch and just want it done, perhaps while you’re at work, we can do that too. We’re here to get your computer issues solved, on your terms. Next time your computer is misbehaving, or you need help setting up a new device or program, let us know. We’ll be able to jump in and get your system moving again without you leaving the house. Our remote support technicians can save you a lot of time and money, not to mention frustration. 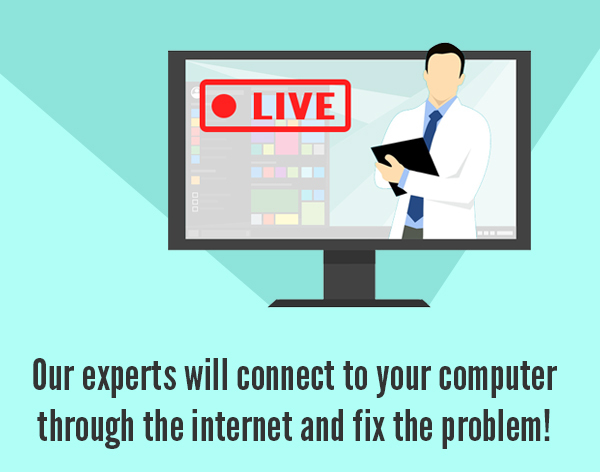 It’s never been easier to get expert help for your computer issues.